Getting started in AWS used to be simple. There was a single service for compute, storage, and a few others services in early trials. Fast forward 10+ years and AWS now offers over 50 services. Taking your first steps can be daunting. What follows is my recommended approach if you already have a moderate or large set of existing applications and deployments that you have to deal with and want to migrate to the AWS Cloud. If you’re starting fresh in the AWS Cloud, check out the companion post to this one. Everything in AWS operates under a Shared Responsibility Model. 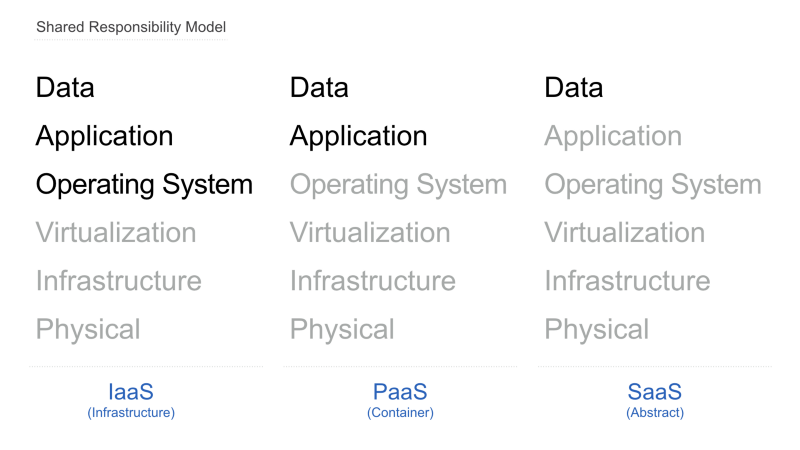 The model simple states that for each of the areas required day-to-day operations (physical, infrastructure, virtualization, operation system, application, and data), someone is responsible. That someone is either you (the user) or AWS (the service provider). The workload shifts towards the service provider as you move away from infrastructure services (like Amazon EC2) towards abstract services (like AWS Lambda). As a user, you want AWS to do more of the work. This should direct your service choice as you start to build in the AWS Cloud. Ideally, you want to pick more and more of the services that fall under the SaaS or abstract — which is a more accurate term when compared to SaaS — category. But given your existing constraints, that probably isn’t possible. So you need to start where you can see some immediate value, keeping in mind that future project should aim to be “cloud native”. 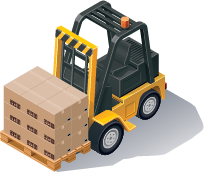 The simplest way to get started in AWS under legacy constraints is to forklift an existing application from your data centre into the AWS Cloud. For most applications, this means you’re going to configure a VPC, deploy a few EC2 instances, an RDS instance (ideally as a Multi-AZ deployment). To make sure you can expand this deployment, leverage a tool like AWS OpsWorks to automate the deployment of the application on to your EC2 instances. This will make it a lot easier to repeat your deployments and to manage your Amazon Machine Images (AMIs). Migrating your data is extremely simple now as well. You’re going to want to use the AWS Database Migration Service to move the data and the database configuration into RDS. Now that your application is up and running in the AWS Cloud, it’s time to start taking advantage of some of the key features of AWS. Start exploring the Amazon CloudWatch service to monitor the health of your application. You can set alarms to warn of network bandwidth constraints, CPU usage, and when the storage space on your instances starts to get a little cramped. With monitoring in place, you can now adjust the application’s configuration to support auto scaling and to sit behind a load balancer (either the classic ELB or the new ALB). This is going to provide some much needed resiliency to your application. It’s automated so you’re going to start to realize some of the benefits of AWS and reduce the operational burden on your teams at the same time. These few simple steps have started your team down a sustainable path of building in AWS. Even though these features and services are just the tip of the iceberg, they’ve allowed you to accomplish some very real goals. Namely having a production application working well in the AWS Cloud! On top of that, auto scaling and CloudWatch are great tools to help show teams the value you get by leveraging AWS services. With a win under your belt, it’s a lot easier to convince teams to build natively in AWS. Applications that are build from the ground up to take advantages of abstract services in AWS — like Amazon Redshift, Amazon SQS, Amazon SNS, AWS Lambda, and others — will let you do more for your users with less effort on your part. Teams with existing constraints usually have a lot of preconceived notions of how to build and deliver IT services. To truly get the most out of AWS, you have to adopt a new approach to building services. Use small wins and a lot of patience to help convince hesitant team members that this is the best way to move forward. Due to the shear number of services that AWS provides, it’s hard to get a handle on where to start. Now that you know your guiding principle, it might be worth looking at the AWS Application Architecture Center. This section of the AWS site contains a number of simple reference architectures that provide solutions to common problems. Designs for web application hosting, batch processing, media sharing, and others are all available. These designs give you an idea of how these design patterns are applied in AWS and the services you’ll need to become familiar with. It’s a simple way to find out which services you should start learning first. Pick a design that meets your needs and start learning the services that the design is composed of. AWS does a great job of providing a lot of information to help get you up to speed. Their “Getting Started with AWS” page has a few sample projects that you can try under the free tier. Once you start to get your footing, the whitepaper library is a great way to dive deeper on certain topics. In addtion, all of the talks from previous Summits (one to two day free events) and AWS re:Invent (the major user conference) are available for viewing on the AWS YouTube channel. There are days and days of content for you to watch. Try to start with the most recent material as a lot of the functionality has changed over the years. But basic, 101-type talks are usually still accurate. There is so much to learn about AWS that it can be paralyzing. The best advice I can give is to simply dive in. Find a simple problem that you need to solve, do some research, and try it out. There is no better way to learn than doing. Which leads me to my last point, the community around AWS is fantastic. AWS hosts a set of very active forums where you can post a question and usually get an answer very quickly. On top of that the usual social outlets (Twitter, blogs, etc.) are a great way to engage with others in the community and to find answers to your pressing questions. While this post has provided a glimpse of where to start, be sure to read the official “Getting Started” resources provided by AWS. There’s also a great community of training providers (+ the official AWS training) to help get you up and running. This blog post was contributed by Mark Nunnikhoven, Vice President, Cloud Research at Trend Micro. Mark can be reached at https://ca.linkedin.com/in/marknca.